Here it is. Enjoy its splendour. Edit: I've just been through the whole website, front to back, and it's literally the best thing ever! 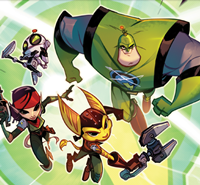 I've been waiting so long for Ratchet and Clank to get a fancy website, and it's packed with new stuff! I wonder if, with all these new images plus this AWESOME new website, we might finally get our second trailer soon?! Also, I'm a bit disappointed Nefarious, Elaris and Grim don't have their own bios. I realize perhaps Nefarious' might have been a tad… spoilery, and Grim is kind of a minor character, like Zed, who also doesn't have a bio, but why no Elaris? Ah, well, I'm still in love with this new website! A new trailer is welcome but only if it is a short version of the October trailer, so it won't spoil anything more but just fit on tv with ~30 seconds. With the two tv spots, countless images shown periodically and the new website a lot of footage has been shown and that's enough! We don't want the movie to be spoiled any more. My god, I was dying when it showed Elaris playing UYA. I see you've gotten yourself a new avatar. I'm assuming you screenshotted it from the movie website? It looks good. Could you screenshot me a good image of Dr. Nefarious shooting that Blarg in the face? About the lenght or about the content. If it is about the lenght the cost of a long trailer is too high, if it is about the content there could still be a minor new scene just not too much. Both, though if I had to choose, I think I'd rather have a short trailer with new content than a long trailer with all old content.